The above narration is the recollection of 25-year-old Ratna Begum, who narrowly escaped death on the fateful night of November 24th, when the eight storied garments factory, Tazreen Fashions Ltd was burned down in an inexplicable fire. 111 of her fellow employees did not make it to the list of survivors. 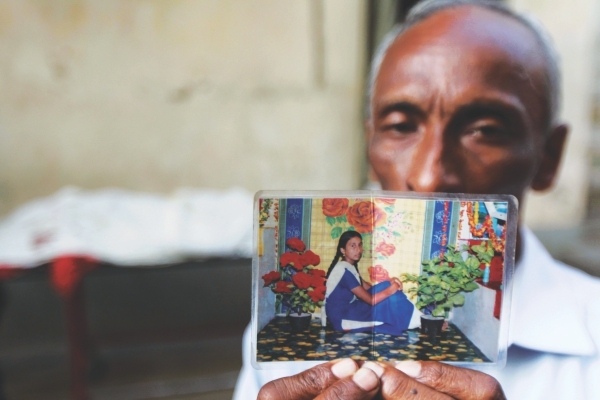 Over the past six years, more than 315 people have died in fires in Bangladeshi garment factories. The reasons behind these deaths have been more or less the same. The improper maintenance of a fire prevention system, excessive manpower and machinery employed beyond the capacity of the factory buildings, inadequate equipment to fight fires, insufficient room to navigate one's way out of the buildings, insufficient number of fire exits, lack of knowledge about fire safety due to lack of training, locking the main gates (exit points) of the factory buildings with an excuse of avoiding pilferage, non-compliance with the National Building Code. Improper storage of flammable materials in make-shift warehouses blocking stairs and other exits, lack of proper ventilation, lack of proper electrical wiring and design, illegal electrical connections- to name a few. At times, the same factory will catch fire two perhaps even three times in a matter of months. Each time, the entire nation is shocked, each time the nation mourns the suffering and death of these faceless, nameless people, there are protests and rallies and demonstrations and demands. 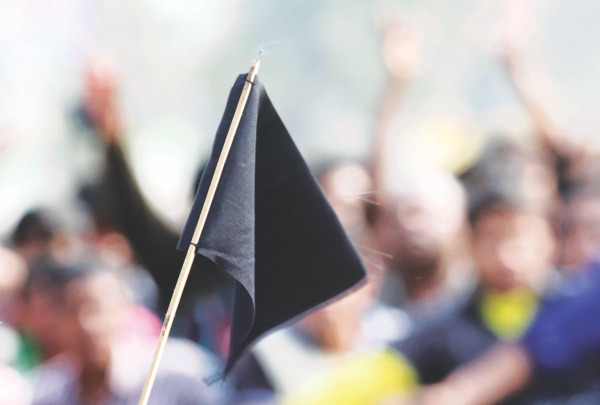 The government comes up with new laws and regulations and the BGMEA (Bangladesh Garment Manufacturers and Exporters Association) and factory owners make new promises. But does anyone ever stop to find out if any of these steps taken are being followed up and actually helping the people who fall victim to this repeated negligence? Once the newspaper coverage and talk dies down, does anyone wonder happens to these people and their families? Humesa Begum from Mymensingh has been working at Tazreen Fashions Ltd for the past four years. When her husband passed away four and half years ago, Humesa realised she could not support herself and her family with the money he had left behind. She left her three children, a daughter and two sons and moved to the city, to earn a living using her sewing skills. She needed the money to pay for her youngest son's education. When Humesa joined Tazreen Fashions, she was told she could not operate sewing machines due to her poor eyesight; she had a cataract in one eye. Unable to afford the surgery required to remove it, she took on the job of a helper. Humesa took home around Tk 4000 or a little more every month, from which she sent Tk 3000 home to pay for her son's tuition and living expenses. Her son Sayeedul Islam was born without four fingers on his left hand, and is unable to do manual labour. Humesa's dream is to educate him and give him a better life. From the remainder of her salary, she pays Tk 500 to rent a small room and saves some for food. For the past four years Humesa has been surviving on meals of rice and a small portion of daal, and on special occasions she has one or two potatoes. She rarely has money to buy clothes or call her family and she has not been home in the past four years. She hasn't taken a day off from work in those four years. On the night of the fateful fire, Humesa Begum was forced to jump out of a window from the third floor of the building. She sustains severe injuries to her hip, legs and the back of her skull. She has no money for treatment. 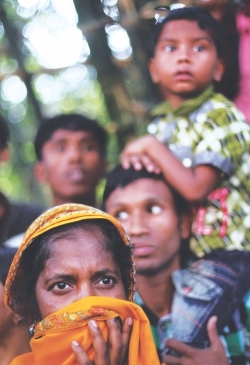 When she arrived to Savar to collect her salary on the 1st of December, on a two wheeled van, she was made to wait all day in a field, in pain, in the heat, before she was turned away and asked to return at a later date. She told The Daily Star that the only thing she worries about is her son's future. She wonders, given her condition, if she will be able to work again. Rubiya helps her parents and two siblings run their household. She does not believe her employers will help pay for her treatment. “They haven't given me my salary yet. That's all I am expecting from them,” she says. The fire brigade arrived an hour after the alarm went off. They blamed the delay on damaged roads and traffic. None of us can imagine what it must have been like to be trapped inside a building, collapsible gates locked, exits blocked, faced with a raging fire, knowing no one will come to help and wondering why they were lied to about the fire and asked to keep on working. It is unimaginable, the kind desperation that makes a person jump off from the sixth storey of a building. We can pick a day of the week to mourn for them, we can dedicate the victory of a cricket match to them, we can protest for a few hours on their behalf, we can try to tell their stories for them, but the truth is this- none of it matters. At the end of the day, these people will once again fade away in the background becoming nameless and faceless and forgotten. They have no rights. Despite repeated allegedly accidental fires, most garment factory owners still refuse to pay for insurance for their employees. This billion dollar industry refuses to spend money on a few working fire extinguishers and a monthly fire drill. It refuses to provide a safe working environment for the very people whose shoulders their industry stands on. The government, The BGMEA, the BKMEA and the factory owners all point fingers and play the blame game, refusing to accept responsibility for these incidents, when all of these institutions are equally to be blamed. If minimum standards related to structural/building regulations, health, and safety are not met, factories should be immediately shut down. A black list should be declared for those factories that do not properly implement these standards. The government should immediately cancel membership of the BGMEA and licenses for all factories that appear on this list. Workers should be ensured health, safety and security. They should be given the right to organise and bargain collectively. The business owners should also guarantee contracts of employment and minimum wage for the garment workers in the entire sector. It should not be forgotten for one moment that the people who work in these sweat factories are human beings. Their lives are not expendable. When the encroaching fire was mercilessly devouring Tazreen Fashions in Ashulia, some working men at the face of death forked out the exhaust fans at the factory and managed their way out, either by climbing down the scaffoldings or via makeshift bridges to the adjacent building. The blaze took the rest, of which 52 unidentified, unclaimed deceased persons were laid to rest by Anjuman Mufidul Islam. “Forty-three of them were identified as female, six male and the others undetermined for those were charred beyond recognition,” says Mawlana Khairul Amin, a duty officer of the burial service. How much time would the workers have needed to get out? A garments manufacturer Rubana Huq says that in some recent evacuation drills she has seen following the fire at Ashulia, it took five minutes to evacuate 1,200 workers from one factory, three and a half minutes to evacuate some 1,700 from another. “We don't have world class structures here, but we need something of a minimum standard. I saw the workers using only one staircase during the evacuation and they were quick,” she says. Tazreen's production manager reportedly assumed that the fire would die out soon and his unforgivable complacency cost over a hundred lives. The workers were either not allowed to escape or could not escape due to the lack of viable escape routes complying with industry safety standards. Either way the onus remains on the owner. Tazreen's owner Delwar Hossain admitted his faults but surprisingly commented that 'no one had alerted' him of the faulty systems as though it was someone else's responsibility. Following the incident, opinions and assessments from different quarters by now have made it clear that the deaths were grave consequences, stemming from the negligence of a number of entities, namely the owner, the government, the garment association, so on and so forth. So who administers how the buildings are built? Rajuk chairman Nurul Huda says that all builders in the designated areas under Rajuk's jurisdiction must get its approval. But while approving whether the building plan complies with set standards, Rajuk checks for the signature of four qualified technical persons – a soil engineer, an architect, a design engineer and a construction engineer. Hence, the responsibility is back on the owner whose organisation Tuba group [that owns Tazreen] reportedly claimed on its website that the group itself was certified by Worldwide Responsible Accredited Production (WRAP), a global certification programme that ascertains sound working condition at apparel production facilities. In reality, WRAP, in an undated statement on its website, says “The Tazreen Fashions Limited factory is not, and has never been, certified by WRAP, nor has WRAP ever even conducted an audit in that facility,” adding that WRAP only certifies individual production units. Tuba group's claim of being certified was completely untrue. On a relevant note, WRAP, on its website put up a list of the certified garment factories in Bangladesh, numbering only 168. In contrast, there are some 4,497 garment factories under BGMEA according to industries ministry sources, out of which 2,858 are operating. It is clear that some garment buildings have violated so many rules that those buildings must be ripped apart and reconstructed at different locations to meet all safety standards. “Not all are the same, some have excellent safety standards and are easily accessible to the fire brigades; but why the decision to identify and shut the malfunctioning factories now and not before the hundreds were killed?” says a garment factory supervisor Abdur Razzak, shocked to see the ruins of the fire-ravished factory at Nishchintapur. Seemingly, the buyers were informed about the malfunctioning safety systems the whole time. For instance, Walmart's 2011 Global Responsibility Report notes on page 80, “… the frequent occurrence of fire safety incidents in [Bangladeshi] factories” had become “a top concern”. They have clearly identified “Residential buildings converted to factories, multi-story buildings located in market areas, factories in multi-story industrial buildings shared with other factories” as the associated risk factors. 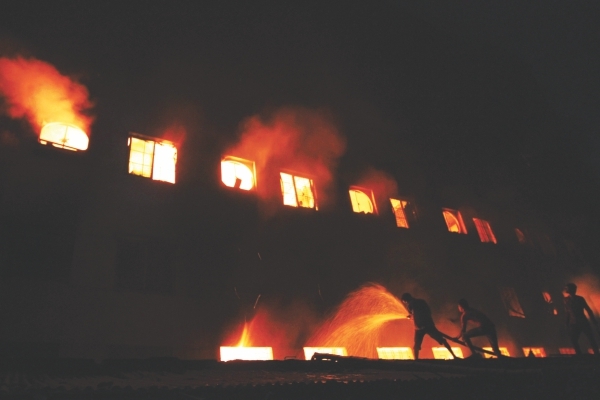 Undoubtedly the BGMEA and the government were informed as well but apparently did not pay much attention despite recurrences of major fire at garments factories since the fire in Mirpur that left 22 garments workers dead. In reference to that incident, Barrister Sara Hossain informs that writ petitions have always been filed by different associations asking why the owners or the persons responsible for incidents of fire at garments factories should not be held responsible. “After four years in 2001, a verdict was given advising to form a committee under the supervision of BGMEA to administer whether the required preventive measures are being taken at all factories,” she says. 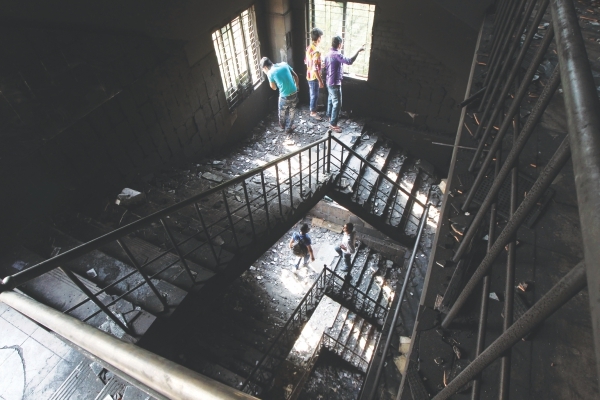 Terming the fire incident at Ashulia a 'subversive act', Home Minister MKA Alamgir promised the offenders would be brought to book but what has history shown us? 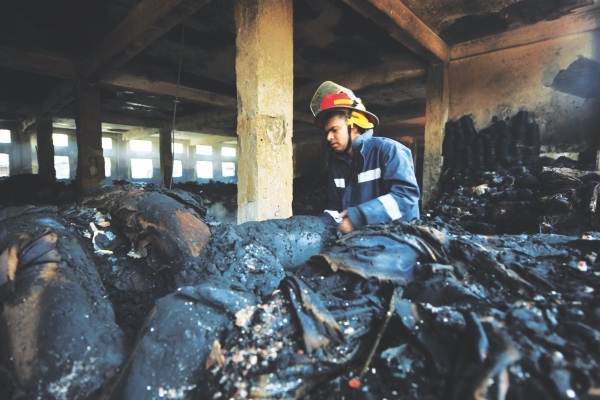 In the last 22 years, the death toll in garments factory fire stands between 320 and 500 according to different sources (Bangladesh Institute of Labour Studies, government and BGMEA statistics), while labour leaders claim it to be more than 1000. Sharing sympathy and offering promises of rehabilitation ring empty in the wake of so many hundreds of lives lost. Despite speculations about arson, the fact remains that these deaths were caused by gross negligence of ensuring basic safety standards. A number of garment manufacturers have confessed that they have to cut corners of their profits to maintain all terms and conditions of compliance standards. It is evident that some of them just kept shrugging off their responsibilities and brushing the safety standards aside because of sheer apathy and the insatiable appetite for more profit. Unless as a society we make sure that this kind of negligence amounts to murder and hence unforgivable, there will continue to be dangerous lapses in safety measures and the possibility of more such unthinkable loss of human lives.